Remember That Whole “Goodbye” Thing We Talked About Last Month? | A Daily Dose of Zen Sarcasm! Remember That Whole “Goodbye” Thing We Talked About Last Month? You know, this whole blogging-every-day thing is hard to break. Nothing against the Pillsbury doughboy or anything, but when I saw this Mary Tyler Moore badge, I felt like YESSSS!!! THIS IS HOW IT FEELS TO END A THIRTY-DAY BLOGGING MARATHON! Because you know, it’s hard to look at a cute girl with an earnest smile tossing her tam o’shanter up in the cold Minneapolis air and not want to BE her, feeling that energy of doing something even mildly significant and feeling enough pride to do something that could potentially be billed as cheesetastically dumb. I want to be that girl, tossing up my hat up in the air and smiling jokeresquely because I DID IT*! *But no one is as cute as Herr Meow saying "I DID IT" when he’s finally figured how to do something he’s not supposed to do– quickly following it up with, "oops?" 01 Dec	This entry was published on December 1, 2007 at 12:30 pm and is filed under NaBloPoMo. Bookmark the permalink. Follow any comments here with the RSS feed for this post. There is no way I’m putting MTM on my blog. I mean, yes, she was cute, I even used to have a mad crush on her when I was in my teens, but no, not now, just no. I can totally relate to that whole hat-throwing thing, though. I’m addicted to sidebar badges, I think. 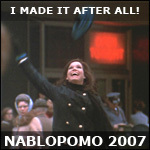 And who doesn’t need one featuring Mary Tyler Moore? Glad you like the Mary badge! Congrats on making it all the way through!